Mike Vargas is a virtuosic listener. 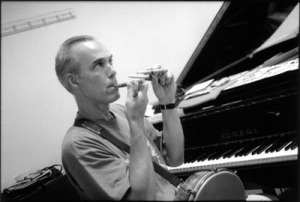 His compositions, performances, collaborations, and improvisations are informed by his surroundings. On the stage, he draws from his bank of musical memory. For dance, he listens to moving bodies and energetic shifts. Although Mike initially trained as a classical pianist, he is largely self-taught via a sensitive ear. Working in a record store sparked his interest in music’s diversity. He explained “that’s when I began listening to music that was not pop.” This exposure led him to dabble in virtually every type of music, from free jazz and world to found sound and electronic. Today, he draws from it all in his improvisations. On Tuesday, the Bates dance community listened to his original work What Is an Open Mind?. The atonal melody wove in and out of itself, always interrupting and being interrupted. Mike explained this element of the piece’s structure: “It’s like walking on top of crusty snow in the winter, and you’re not sure when you will fall in.” He artfully utilized a variety of textures, as one might use different energies on unstable ground. The music featured sparse notation in one moment and a chaotic palette in the next. In addition to the concert stage, Mike improvises for dancers, and has been doing so since 1978. His extensive work in the field has taught him to listen to movement and energy, then convert it into music. Peek into Plavin studio between nine and ten thirty and you may hear a jolly Strauss-esque waltz, an electronic drum set groove, or an ethereal gong soundscape. His sense of musical possibility is endless. For Mike, the most rewarding aspect of improvising for dance classes is working in real time. In human time. He is not merely an accompanist; he is certainly not a human jute-box; he is an artistic collaborator.